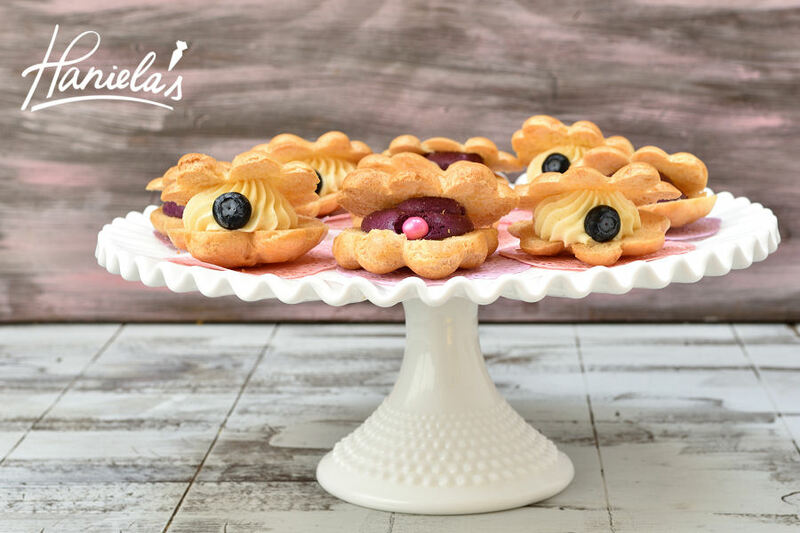 We love cream puffs! I make them quite often actually. Once a month at least. I usually fill them with German Vanilla Buttercream, dust them or drizzle them with melted dark chocolate. They are so delicious and easy to make. Seeing all the seashell desserts on pinterest got me thinking, what if I made seashell cream puffs. It’s not impossible, right? To make seashells I used my favorite pate choux dough recipe, it uses oil instead of butter and for the filling I used scrumptious and summery blueberry mouse and German Vanilla Buttercream. For the pearls I used Sixlets Candy and fresh blueberries. Here is a video how to make pate choux (using oil, you can easily use butter instead) dough and German Vanilla Buttercream. ice cream, in your yogurt or you can make delicious mousse. Fruit puree can be made ahead of time. a small dish or a cup, bloom gelatin in the water for about 5 minutes, then use microwave, for 5-8 seconds, until dissolved, stir well. Let dissolved gelatin cool to room temperature. stir well, and then add remaining fruit puree, stir well. Fruit puree and gelatin should be both at room temperature. on high until it is stiff and it has cooled off a bit. Using a mixer or a whisk, whip the cream until stiff peaks are formed. In a large bowl fold meringue into the whipped heavy cream. Gradually whisk in whipped heavy cream/meringue into the fruit puree. Pipe mouse onto the bottom halves of a cream puff, place the tops on the mousse pressing slightly in the back, keeping the front wide open. Then gently press a contrasting pearl into the mousse.I used Sixlets for the pearls. Another filling variation – you can use is Vanilla German Buttercream and for the pearl you can use a fresh blueberry. It’s super tasty and really pretty too.